This laser free method of skin resurfacing uses glycolic acid to gently yet dramatically improve the skins appearance. By speeding up the skin’s natural renewal process this treatment allows new healthy skin to come to the surface. 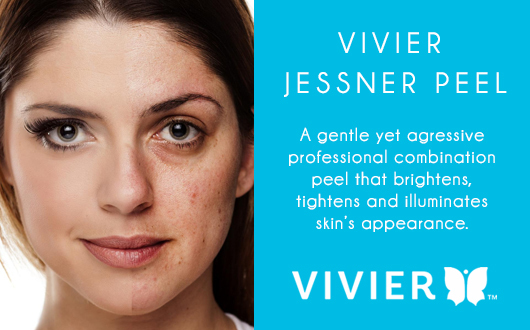 False Creek Skin Solution Clinic has a variety of different peels to address your specific concerns and desired results, including the Viver Jessner Peel which is the most powerful peel available in all of Canada. The painless treatment lasts around 30 minutes and produces immediate visible results, however, we recommend a series of 4­-6 peels within 2­-3 weeks of each other to produce the most dramatic improvements. You will experience some redness and skin sensitivity immediately following your peel but you should be able to return to a normal daily routine after a few hours. Q­ - What do chemical peel treatments feel like? A – You will feel a very mild tingling sensation that may become warm during the course of the treatment. Most patients find the procedure quite comfortable and even relaxing. Q­ - How many chemical peel treatments will I need? A­ – Most patients achieve noticeable results with only one treatment. With regular ongoing treatments you can increase the intensity of the results. Q­ - When will I see results from my chemical peel treatment? A­ – Results show immediately after treatment. Q­ - Are there any CHEMICAL PEELS side effects? A­ – There may be some slight redness, irritation and some lingering tingling sensation after treatment but this often subsides very quickly. You may proceed with any of your daily activities immediately after your treatment.